Points Northeast is the area of Tacoma, Washington that is located across Commencement Bay from downtown Tacoma. 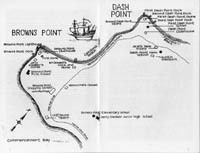 The three distinct areas are Dash Point, Browns Point, and Northeast Tacoma which extends from Cresent Heights to near Fife. This area stretches along the bluffs which overlook the tide flats of the Puyallup River separating it from the downtown area. Historically speaking, we represent the Washington state communities of Browns Point, Dash Point and Northeast Tacoma which are located across Commencement Bay from Tacoma proper. Our History Center is located in Browns Point Lighthouse Park. The Browns Point Lighthouse marks the entrance to Commencement Bay and along with its buildings is on the National Registry of Historic Places. The first lighthouse on Browns Point was erected in 1903, but that's quite a story that continues to the present day. We also have stories to tell about Dash Point and Northeast Tacoma. To read all about it, we invite you to browse through our site's historical pages.So with your curious mind and computer mouse enjoy our history. If you're in the neighborhood, come by to see our History Center to do research or to enjoy exhibits which change periodically. Our open hours are Saturdays, 1 - 4 p.m. from March through November. When visiting light keepers are in residence in the Light Keeper's Cottage, part of their duty is to have the buildings open to the public on Thursdays and Fridays, also from 1 - 4 p.m. A trip to Browns Point Lighthouse Park is not only a lesson in history, but also a visual treat with Puget Sound at your feet and the Olympic Mountains in the distance to the west. Bring your children to play on the beach.